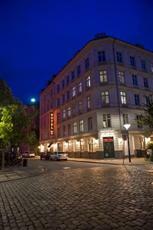 The Hotel Tiffany is perfectly located for both business and leisure guests to Copenhagen. The Hotel Tiffany boasts a convenient location with modern amenities in every guestroom and superb service. In-room facilities include non smoking rooms, bathrobes, daily newspaper, desk, hair dryer, ironing board, in room safe, television. Guests can experience the high standards of comfort while staying at this luxury Copenhagen hotel with everything they need right on the site such as elevator, laundry service/dry cleaning, safety deposit boxes, business center, bicycle rental. In addition, the hotel's guests can enjoy the leisure and sports facilities provided on the premises: massage, indoor pool , jacuzzi, golf course (on site), gym. The hotel provides a warm and welcoming service of international standard. To proceed with this reservation at the Hotel Tiffany, please enter your visit dates and follow our secure online booking form.